The 2019 GT-R range of quadcopters is one of Diatone's newest. The 115mm GT-R249 that I have tested utilizes a single sheet of CF for the chassis, and an aerodynamic plastic cowling to protect the FPV camera and interior components. The FC, ESC and motors are all Mamba branded, while the FPV camera and VTX are a combo from RunCam. Diatone have stated that the stock tune for this little 2.5” is optimized for 3S voltages despite full 4S capability, and I can further confirm that the stock tune on 4S leaves the motors very warm. The first thing you find beneath the model are some Diatone stickers and a card clarifying one or 2 of Diatones policies and confirming they have only 1 official website. 2 instruction manuals – one for the FC & ESC and the other for the VTX. Be aware that the manual for the FC and ESC also shows the larger (30.5x30.5mm) Mamba stack, so don't get mixed up! Included are a few bags of ('T' type) prop screws – a nice addition to these is a visible spot of blue thread locker, some shorter spare motor screws, also with a touch of thread locker, and an optional buzzer that can be simply plugged in using the pre soldered wire. I glued the buzzer to the back of the FPV camera as the wire was not long enough to place it elsewhere, on reflection though this is probably not ideal as it may cause an imbalance introducing vibration to your video. Lastly, one single, solitary, lonely set of GemFan Flash 2540 props (2xCW & 2xCCW). The frame is really well finished with all the edges of the CF nicely chamfered, all the screws for the canopy and standoffs have countersunk holes giving a real nice feel to the finish. The canopy adds an aerodynamic finish to the model and while maybe not as durable as a CF top plate the minimal weight of the model should allow the canopy to survive all but the heaviest crashes. The canopy does provide some protection for the camera and the stack as well, this protection could be a little more substantial, but I think they have found a pretty good balance while still keeping the weight down. The single set of 2.5” props supplied with the GT-R are GemFan flash 2540R tri-blades, and paired with these 1105, 5500kV motors this thing is unbelievably quick. I have used the GemFan flash props in a few larger sizes, the 3” and 4” versions are quite aggressive and as such are quite grippy through the corners with great acceleration, and these 2.5” versions show similar characteristics. I think that these props might be a bit aggressive for running 4S optimally, and could well be a contributing factor for the high temperature of the motors when the model comes down. I'd like to try a 2525 or 2530 prop and see if it's easier to tune and helps to cool the motors. These GemFans are however, great, top quality props, it's a real shame that Diatone couldn't see their way to provide any spares. I am usually a bit disappointed when I only get 2 spares (3 x CW and 3 x CCW), but really guys, none at all? On the plus side the model only weighs about 70g dry so there is minimal inertia carried into crashes, but it’s not a lot to rely on to save your props! The 1105, 5500kV, Mamba branded motors support 'T' type props and despite finding that as motors get smaller the windings get messier, these have pretty clean windings for their size. Thankfully there are good size vents in the base to allow ample air flow and cooling, without them I doubt that the motors would be capable of running on 4S at all! I have to say though, that these 1105's are shockingly quick, and the tiny model responds so fast to your inputs that it feels like you have increased your normal rates. The Mamba 20A 4-in-1 ESC runs BLHeli_S firmware operating over DShot protocols (max DShot 600). The burst current rating of the ESC is 25A for 5 seconds, and I think that this is probably good for these little motors, the ESC’s do get a bit warm driving the 1105 5500kV motors, but not so hot to worry about it. I would worry about how easily a 15A ESC would handle the draw, so I think that while the max amp rating would probably be sufficient, I would have concerns over the longevity of a smaller ESC. A great little inclusion on the ESC is a tiny low ESR capacitor (25V 470uF) which helps to limit the electrical noise affecting the video feed and Flight Controller calculations. 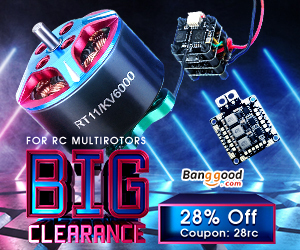 Check the Diatone 2019 GT R249+ on Banggood, currently on discount. I am really impressed with the 20x20mm Mamba F4 Flight controller - It has a very well thought out layout with easy to access, good sized soldering pads. There is a pre soldered wire to connect the buzzer should you wish, and a pre soldered wire to connect to your serial RX too. I mentioned previously that the PID’s have been set up for running 3S voltages, when running 4S you will need to adjust the tune to dial out some high throttle oscillation, also the motors do get quite warm running on 4S, so adjusting the tune to allow the motors to run cooler is highly recommended. Despite the oscillations I felt right at home flying the GT-R249, almost instantly after take off - yes the tune needs adjustment but the flight characteristics inspire so much confidence that 30 seconds into my maiden flight, I dropped all pretense and just ripped it around flying all out acro maneuvers. Another great addition to this little FC is the 16mB of flash memory for black box logging. It seems that, with the default settings, the flash memory will capture about 5 mins of flight data, (roughly the same amount of time as flying 2 packs) so you can easily analyze the difference in characteristics between 2 different tuning setups. The FPV camera is a tried and tested RunCam micro swift, with low latency and great WDR light handling. Sadly the controller for the FPV camera has not been included, the default settings are ok for me, but they do leave the color a little washed out - I would like to adjust the settings to improve the colour shown in the display, thankfully I have a controller from a previous purchase to enable me to do this. The VTX is part of a combo from RunCam which pairs the Micro Sparrow FPV camera with RunCam’s TX-200 VTX. The TX-200 can output a maximum of 200mW, but, as regulations in many countries demand, it is locked to the 25mW power output by default. For HAM or Restricted Radio operators and other qualified pilots, unlocking the higher power output options and restricted frequencies of the VTX is easy enough, just hold the button on the VTX for 10 seconds. This little VTX is designed to be attached to the back of a micro sized FPV camera, but Diatone have decided to forego making use of this, and have designed a plate for it to be mounted within the stack. The TX-200 doesn’t have a digital display so you will need to decode the LED flashing sequence which notifies you of which Channel, Band and output power you are using. Alternatively you can configure IRC Tramp to allow the FC to control the VTX frequency, through the OSD. The ideal battery for the GT-R249 is a topic for some debate, the core of that debate is 3S vs 4S. Some say that the additional voltage from running a 4S pack is not enough to offset the additional weight of the extra cell. Did I mention the quad is pre-configured to run on 3S? Yes, quite a few times I think! Powerful lightweight quads, such as this 2.5”, are generally pretty sensitive to PID adjustments, filter adjustments and the weight of the battery you are using. I think, the heavier pack - the more sensitive to tuning adjustments. Considering this, tuning for a 450mAh 3S and a 650mAh 3S may require less PID adjustment (if any), than using these different capacities at 4S voltage. With the additional cell of a 4S comes a (roughly) 33% increase in the overall weight of the pack, thus the difference in weight from the additional capacity of the pack is also 33% greater, possibly making 2 PID profiles a necessity if using 2 different capacity batteries. Due to this I think Diatone chose to stick with a 3S tune for the default. The Diatone 2019 GT-R 249 2.5” is brilliant in the air, I will once again state that the default tune is for 3S and will need to be adjusted for 4S voltage, but even so, despite high throttle jello due to oscillations, it flies really well. It accelerates like a bullet and changes direction with the speed of a house fly, in fact it is so responsive it feels like you have increased your rates. The confidence that this little quad gives you is incredible for a model of its size, and the exhilaration of flying on board something that handles like this is amazing. It moves so fast that you feel like you are pushing the boundaries even when performing tricks you know well, but it allows you to complete the trick so easily that it feels almost like its reading your mind! In short the GT-R249 is an absolute blast to fly and is so small that it can be great anywhere! Diatone have done really well with this little drone, the Mamba FC, ESC and motors are an exceptionally powerful combination, and the RunCam FPV camera and TX-200 VTX combo are a tried and tested pair that work very well together while remaining very lightweight. The frame is really nicely finished and the extras that are provided are extensive, the thread locker already applied to the screws shows amazing attention to detail and the optional buzzer is a really nice touch. It would be nice if Diatone could provide some base PID’s for a 4S tune, but we’ll just have to take care of that for ourselves. Cracking components in a brilliant little package, for a very reasonable price. Extremely powerful little quad that is super fun to fly and small enough to enjoy pretty much anywhere. Very lightweight so you will never be over the 250g weight limit imposed in many countries. A plethora of spare parts and extras included in the box with really great attention to detail. The instruction manuals are comprehensive and easy to follow, and the online documentation for the stack, VTX & FPV camera combo are also easy to find should you require additional information. I recently reviewed the 3” Eachine Wizard TS-130 and one of the cons was that the controller for the FPV camera was not included, it’s not a major problem unless the camera settings do need adjustment, but it’s exclusion is understandable. The only other thing that I could mention is that there is no tune for a 4S setup, however neither of these points is that much of an issue. The Diatone GT-R249 2.5” is, all in all, a great little drone, maybe not ideal as a first model - especially considering there are no spare props provided - but a fantastic second or third model for anyone.